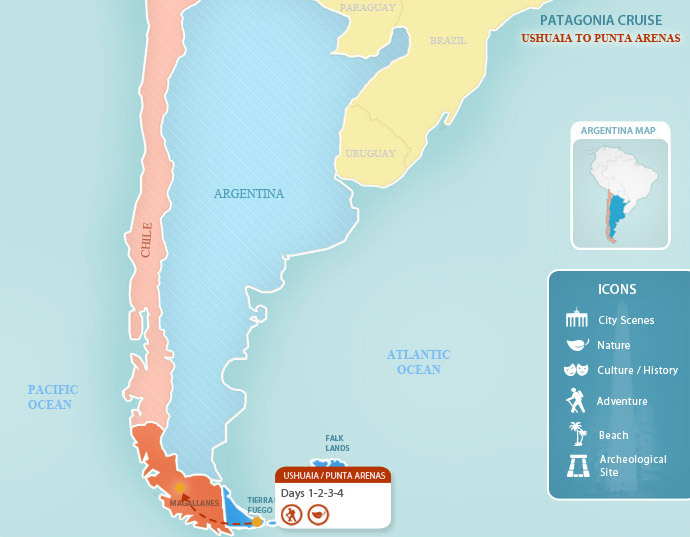 Starting from the world’s southernmost city, Ushuaia, in Argentina, and ending at the foot of the majestic Andes in Punta Arenas, Chile, this Patagonia cruise will take you through a mysterious region of unparalleled beauty and icy wonders through two of the most attractive countries in South America. You’ll follow the path of legendary seafarers and explorers past Tierra del Fuego and Cape Horn and witness Glacier Alley, a row of glaciers, each named for a different nation. Though you’ll enjoy most of the stunning scenery from the comfort of your cruise ship, you’ll also have several opportunities to step ashore and experience Patagonia and its glaciers up close. If you’re looking to add a bit of adventure to your Argentina vacation, a Patagonia cruise around the edge of the world is a one-in-a-lifetime addition. Note: This cruise is available starting from October 2012. Ask your travel advisor for more information. You’ll spend the day in Ushuaia, depending on your arrival time, until it is time to start your Patagonia cruise. You can check in anytime between 9 a.m. and 4 p.m. Between 5-6 p.m. you’ll board the ship to the greetings of the captain and crew. They will welcome you onboard with cocktails and you will settle into your comfortable cabin for the start of your Patagonia cruise. The ship will depart shortly after toward Punta Arenas, the final destination of your exciting trip. You will cruise along the sapphire waters until you reach Cape Horn National Park where you will disembark to explore the famous Cape Horn region via Hornos Island. This legendary place is known as the “End of the Earth” and was declared a UNESCO World Biosphere Reserve in 2005. Return to the boat and continue on your journey. In the afternoon, you’ll come to the Wulaia Bay, once the site of one of the region’s largest aboriginal settlements. Disembark again and traipse through the forest of native vegetation such as Lengas, Coigües, Canelos, and ferns. You’ll be greatly rewarded for your efforts as you reach a spectacular lookout point before returning to the ship to enjoy a quiet evening sailing through the beautiful Patagonian landscape. Today you can take it easy and enjoy you spectacular surroundings from your ship’s deck as you cruise through the Brecknock and Ocasión Canals and pass the awe-inspiring Gunther Plüschow Glacier, named after the pioneering German aviator. In the afternoon, you will sail to Chico Sound, where you will disembark in Zodiac boats to admire the majestic Piloto and Nena glaciers and beautiful waterfalls from the Alakaluf Fjord from up close. Today is the last day of your Patagonia cruise. You’ll start the day by going ashore at Magdalena Island (depending on weather conditions). This is the home of a gigantic colony of nearly 120,000 Magellanic penguins who use this otherwise uninhabited island as a breeding ground. Note that the penguins migrate in April, so as an alternative, you may be able to visit Marta Island to see a sea lion colony instead. After visiting the penguins (or sea lions), you’ll return to the ship to sail on to your final destination: Punta Arenas. Your Patagonia cruise will conclude around noon today. You can stay and enjoy the tiny yet charming town of Punta Arenas, continue your Latin America vacation by booking an exciting Chile vacation package, or meet your transfer to the airport for your return trip home. Prices may vary according to the season, availability, and client preferences. Please contact one of our expert travel advisors for more information. Located right on the shore of the Beagle Channel, only a few miles outside Ushuaia, the Los Cauquenes Hotel is a gem of luxury. You will only find five star services at this full resort and spa. The 54 rooms boast front-row views of the Beagle Channel or the Andes, and are fully equipped with TVs, telephones, safe-deposit boxes, and mini-bars. Babysitting, storage for ski equipment, complementary PCs with internet access, and laundry and dry cleaning services are available. Guests will also find a health club, fitness center, drug store and gift store in this all-in-one resort. To top it off, this hotel also has a fabulous restaurant serving up international and local specialties with an impressive wine list to match. Located on the coast of the Beagle Channel about 2 miles from Ushuaia, Hotel Las Yamanas is steeped in the history of the Yamanas people, the ancestors of the region. All rooms are decorated in a rustic style, with elegant wrought iron bed frames, gorgeous bedspreads and absolutely breathtaking views of the channel and the snow-capped Andes. Rooms are equipped with sommiers beds, color satellite TV, internet, mini-bar, telephone, safe-deposit box, and heating. Other services include 24 hour laundry service, a reading room, a fitness center including hydro-massage and water Shiatsu, steam baths, a sauna, massage, and exercise equipment. You can also take advantage of the bi-weekly Argentine barbeques, and stroll along the footpaths comprising the extensive grounds. The restaurant serves excellent wine, Fueguino lamb, fresh salmon, and many more exquisite dishes. An intimate bed and breakfast, Hotel Macondo House, is located in a beautiful spot just a short walk from the center of Ushuaia. The interior is elegantly decorated with natural, earthy tones, and offers stunning views of the Ushuaia bay and mountains. The living room is complete with a cozy fireplace, and the hotel’s seven rooms are spacious and stylishly decorated with fresh white linen and wooden flooring. Guests will without doubt enjoy the home-made Argentine breakfast, served by the friendly staff. Dreams Del Estrecho is an excellent modern five-star hotel strategically located steps away from the Plaza de Armas in Punta Arenas. The hotel enjoys a magnificent view of the Strait of Magellan and Tierra del Fuego. Besides its 88 rooms, fully equipped and furnished with the latest modern amenities, this luxury hotel includes amazing services that will keep its guests entertained and comfortable. Enjoy gambling in the casino, sipping a cocktail in Sky Bar with a 360° panoramic view of the city, dining in the restaurant and café, or relaxing in the spa and fitness center. This elegant hotel, with its first-class service, can only add to your comfort and well-being while on your exciting Chile vacation. This charming hotel is located in the center of Punta Arenas in one of the oldest mansions in Patagonia. Formerly the private residence of Jose Nogueira, a historic pioneer character, the building was declared a Historical Monument in 1982. Carefully restored and emanating a true sense of history, the Hotel Jose Nogueira now offers 22 rooms including 5 suites all exquisitely decorated and featuring all the services and comfort of a grand hotel. Rooms vary in size and shape, and possess their own personality and characteristics. Hotel Jose Nogueira prides itself on its first class personalized service that will make every guest feel at home and well provided for. Savor delicious regional and international dishes in one of the two interior dining rooms or in the winter-garden to take advantage of the long summer days. Hotel Finis Terrae is probably one of the most charming hotels in Punta Arenas and is located in the heart of the city. This classic and refined three-star establishment, part of the world renowned chain Best Western, offers all the services expected from a hotel of this category, and more. Enjoy a wonderful dinner in the hotel’s Panoramic Restaurant, or have a cocktail at Restobar to unwind. All 64 tastefully-decorated rooms provide the utmost comfort and modern amenities. As of 1 January 2010, an entrance fee (Reciprocity Fee) is chargeable for citizens of the United States, Canada, and Australia flying into Argentina. The tax does not apply to travelers arriving by road or sea. Travelers who have an American, Canadian, Australian, Albanian, and Mexican passport must pay an reciprocity fee before arriving at immigration control: United States - USD 160, Canada - USD 132, Australia - USD 61, Albania - USD 30, Mexico - USD 26.